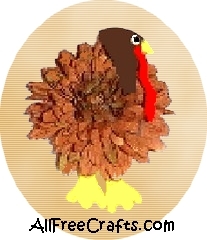 Use a brown silk mum to make this cute turkey craft for Thanksgiving Day! Print out the pattern then cut out and trace each pattern piece onto felt. Cut out each piece. Remember to cut out two legs. Take your brown mum and remove flower from the stem, including any leaves. You must, however, leave the plastic back on so mum stays together. Lift the petals and glue the head in put petals back in place. Glue the red wattle on the head as shown in the picture. Then glue the yellow beak to the red wattle. Glue on the goggle eye. On the back side of the mum at the bottom, glue the feet on. Now you can either glue on a pin back and give your turkey as a gift or glue on a magnet and put it on the fridge. Enjoy!